Published on 18 May 2012. If you follow me on Twitter, you’ll know that Wendy and I were evacuated from the Handmade Burger Company at the Metrocentre tonight after our meal was rudely interrupted by the restaurant setting on fire…! One of the downsides of the open kitchen is that the flames were quite clearly visible. Initially, we were told to ignore them, as the gas had been turned off and they’d soon subside. But we were warned that our chips might be delayed. As the flames persisted, the chef produced a fire extinguisher, which also failed to extinguish the flames. We were reassured that everything was fine, even as the fire alarms were blaring… it was only when the sprinklers started that the staff decided the time was right for an evacuation… of the whole centre. We didn’t even get our chips! 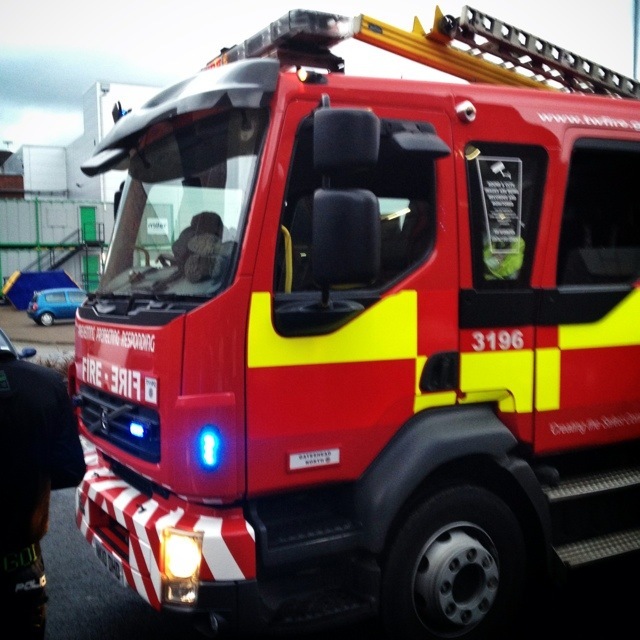 The picture shows the fire engine that came to the rescue. There may have been more than one, but Wendy and I walked across to the McDonalds on the nearby retail park as soon as we were out – we were hungry! I guess you could say that our whole evening was flame-grilled, not just out burgers! This 1,653rd post was filed under: Photo-a-day 2012, Food, Gateshead, Metrocentre, Retail.